The information age was supposed to kill-off the role of the salesperson. Any potential buyer could go out and, with sufficient research, discover a solution that best fits her needs and purchase it on the virtual spot. This clearly has not happened. In fact, salespeople are now more important than before, though the focus of their importance has shifted from being knowledgeable experts (which they assuredly still are) to being relationship experts, focusing on how salespeople personally interact with customers. The same holds true for real estate professionals. 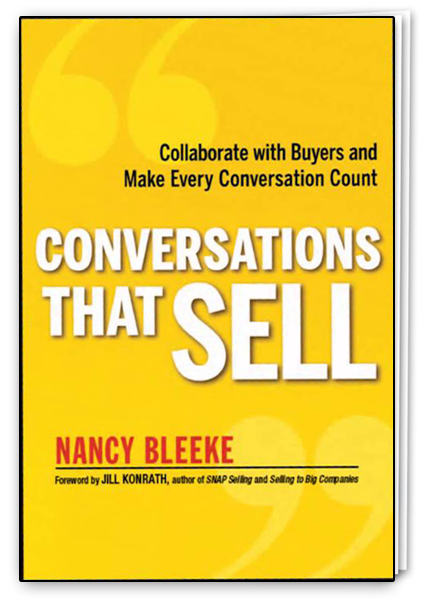 In her book Conversations that Sell, author Nancy Bleeke espouses a collaborative approach to the act of selling. Bleeke's stated goal in penning this book is to help shatter the negative stereotypes that have grown-up around the salesperson and his practices. Bleeke suggests, instead, that salespeople can build better relationships and earn more repeat business with clients by fundamentally altering the sales approach by focusing on building solutions with the buyer rather than simply pitching a potential solution at the buyer. The collaborative approach is different from the consultative approach. A consultative approach often begins with establishing requirements/information gathering, followed by a retreat to some faraway office to concoct the sales team's interpretation of a perfect solution, and concluded by the presentation of that solution to the client. In this approach, however, the sales team has already crossed the Rubicon and put all of their energies into one of many possible solutions. Meanwhile, the prospective buyer sits back in a cool, detached position, and is thus more prone to sharp criticism and a marked lack of engagement. Nancy Bleeke's proposed method shifts the focus to the buyer and his unique set of Problems, Opportunities, Wants, and Needs. This is an important distinction for real estate professionals. In Conversations that Sell, Bleeke advocates eschewing the consultative step of taking requirements off to work on a solution in a vacuum and, instead, sketching out a solution with the customer as you gather requirements. This shift in the sales approach can empower real estate professionals to demonstrate expertise, tailor an appropriate solution to the client's needs, and gain buy-in from the client - all in the same action. THINK POINT #1: What's In It For Them? Bleeke's method begins with answering a very important question to consider with every prospective client: What's in it for them? If I were a homebuyer, what would motivate me to purchase this home? Why does this home fit my needs better than a different solution? By establishing the answer to this question as the driver of the sales presentation, the agent puts himself in a position to be a genuine problem solver for the prospective buyer rather than merely another agent trying to sell a home that the buyer may not even gain value out from. Today's homebuyers are also under increasing pressure; it is not just salespeople who have goals to reach. Buyers, on the whole, simply have no patience for a salesperson wasting their time on a canned pitch. Throughout her book, Bleeke stresses the importance of maintaining respect for the buyer's time and focus by advising that salespeople acknowledge and appreciate the buyer's time and make a pledge not to extend meetings beyond the allotted time. Additionally, Bleeke also notes that some salespeople may feel pressured to try and push a particular solution, sometimes even when they feel that another solution will fit the client better. This is also true for the sale of a home. No one wins when you try to force a square peg into a round hole. The homebuyer will eventually come to find that the home she has purchased falls short of fulfilling her needs, and she will likely sour on the seller and his other services. By aiming for the short-term, the agent has inevitably sacrificed future business with the buyer. Although we live in an age of widely available information and decision support, it is still important to remember that homebuyers are still as unique (if not more so) than ever before. Bleeke describes and discusses what she calls the four "Tribal Types:" Achiever, Commander, Reflector, and Expresser. These are four general personality types and associated characteristics that buyers will exhibit. In discussing the collaborative selling process and how to approach and recover from potential pitfalls with each of these types, Bleeke makes observations about what drives each of these Tribal Types so the salesperson can understand what style of communication will best convey his points to the buyer. By following the five-step approach that Bleeke outlines, real estate professionals can easily diagnose where any particular sale breaks down and determine next steps to move the sale forward. The five steps are Wait, Initiate, Investigate, Facilitate, Then Consolidate (or WIIFT). These steps detail the process from research to close and aid the buyer not only to achieve efficiency through a structured approach but also to make such an approach repeatable. Wait: The process begins with committing time and effort to researching the prospective buyer by identifying her Tribal Type (if possible from previous communication) and her Problems, Opportunities, Wants, and Needs. This is the step that is easiest to gain an advantage with because it is the one step that the seller completely controls. Initiate: Every time communication is initiated with a prospective buyer, it is important to craft a greeting that explains who you are, why you are calling, and the value you can provide. Bleeke reminds the reader that salespeople only get one chance to make a first impression, and by structuring a clear greeting that conveys potential value to the buyer, the seller stands a much greater chance of capturing the buyer's attention to move the conversation along. Preparation and execution applies equally to cold calling an unknown prospect to a sales presentation with a long-time client, as well as every scenario in-between. Investigate: Once the conversation has moved past initiation and the agent has the buyer's attention, it is important to begin the process of discovering/confirming her Problems, Opportunities, Wants, and Needs. Often, an agent following this method will uncover Problems and Opportunities the buyer was not even aware. It is also important to be transparent, honest, and work diligently to discover potential pitfalls of the home-solution you are pitching to the buyer. Early detection of a misfit between your proposed solution and the buyer's situation is vital to identifying a better solution, earning future business, and/or earning a referral. It is morally paramount to know when to put the buyer's needs ahead of your sales goals and to communicate to the buyer when you do not possess an appropriate solution to her unique circumstances. Beyond ethics, treating others with honesty and respect will undoubtedly preserve the relationship and potentially earn future business or referrals. Facilitate: After identifying the buyer's primary Problems, Opportunities, Wants, and Needs and selecting appropriate home-solutions, the agent needs to assist the buyer with making a decision. This facilitation comes in the form of educating, recommending, and collaborating with the buyer to explore appropriate options and select the one that addresses all of her pain-points. Bleeke argues that this is, in fact, the most important step in ensuring sales success. Buyers need to know that they have the kind of support for their decision that they can defend to others (e.g., family members, co-workers, etc.). In this way, it is important to remember that buyers and agents are on the same side rather than struggling in opposition. Then Consolidate: An important and oft-overlooked step is the effective closing of a conversation. Not every conversation with a prospective buyer will end with a sale, and it is important to have a goal for each communication. If the goal is to secure a sales presentation, then the close of the conversation should involve scheduling the presentation, and if the goal is to secure a sale, then the close of the conversation should be to ask the buyer if he is ready to make a decision. At all times, however, the conversation should end with identification of action items to follow up on and report to the buyer. This ensures a focus in the sales process, holds the salesperson accountable for deliverables, and schedules another interaction with the buyer. Underlying Bleeke's five-step sales process are two fundaments actions that need to be performed constantly. The first action, prepare, involves doing appropriate research to know what Tribal Type the buyer embodies and what the Problems, Opportunities, Wants, and Needs the client has that your solution can address. The second action, prove, is providing a constant value proposition to the client. From start to finish, the agent needs to demonstrate how he and his solution can provide value to the buyer. By following Bleeke's five-step process and adapting your value proposition to each client's personal (Tribal Type) and business needs (Problems, Opportunities, Wants, Needs), the well-informed real estate professional can reach his clients more effectively. These are just mechanical means to an end, though. The goal for a real estate professional is to set the stage with these techniques so that the agent and the buyer can speak a common language and collaborate on the final solution. In removing the "us-versus-them" mental barrier and seeking solutions that are co-produced by both parties, sales will transform from "pitch-and-pray" to value-laden buy-in and repeat business. To achieve a successful outcome requires adequate identification of the client's needs and sufficient pointed questions to uncover the resolution he envisions. The salesperson's role then is to augment that vision, either by offering input the buyer may not have considered or by helping to facilitate the transition from current state to future state. As salespeople, we are called upon to solve our clients' problems, not to forcibly insert ourselves and become additional problems for our clients. Bleeke, Nancy (2013), Conversations That Sell, New York, NY: AMACOM. Jacob Christie is from Portland, OR and received an MBA in May 2013. He has four years of experience producing creative solutions to unique problems and communicating technical concepts to nontechnical users. Jacob utilizes his education and experience in a technology consulting role.